Note: This book is a companion to A CROWN OF WISHES, and thus will have no spoilers for the previous book in the series. 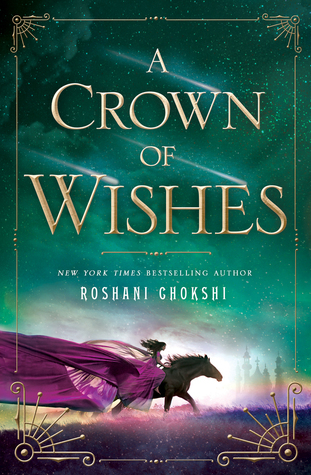 Roshani Chokshi does it again with A CROWN OF WISHES, the companion sequel to her best-selling THE STAR-TOUCHED QUEEN, which you can find my review here. Filled with heavy imagery and a flowy prose, this book focuses on Gauri, a warrior princess who tried to take the throne and failed, and Vikram, the fox prince who wants to extend beyond his name as the next puppet king in the country his father rules. Both characters are so endearing and you really fall in love with them – and their dialogue – as we enter this magical adventure with them. The book starts with Vikram getting invited to play the Tournament of Wishes, where the winner gets a wish fulfilled. However, he also has to have a partner – and she may come at an inopportune time. Gauri arrives as a prisoner made by her own father the king of Bharata to Vikram’s court. It turns out that she’s his partner for the Tournament of Wishes, and the story gets rolling from there. I know a complaint for some readers for THE STAR-TOUCHED QUEEN was how confusing the writing and descriptions could be, but it’s much less evident in this book. There are more tangible scenes (rather than the very ethereal situations in THE STAR-TOUCHED QUEEN) that readers will have an easier time imagining in their heads. The descriptions are as beautiful as always, although some readers may be tired of the abundance of flowery words, which can head towards purple prose territory pretty fast. But despite it, I certainly didn’t have a problem while reading, and it only heightened my reading experience. There are so many magical elements to this book, and several characters that readers will fall in love with as Gauri and Vikram enter the Tournament of Wishes. We get to read between Gauri’s first person POV and Vikram’s limited third person POV, which allows us to really get to know the characters. Both are burdened with things of the past and want to win this tournament to use that wish and get what they want. Chokshi does a superb job in painting their desperation and anguish over not having what they wanted. Eventually they realize how much potential they had in themselves to fulfill those goals of theirs. The romance was extremely well-done, sweet, and slow. In the first meeting between Vikram and Gauri, Gauri is a prisoner and pretty much attacks him. Their banter is so hilarious and charged with wit. I also enjoyed seeing familiar characters from the previous book pop up in this one! I think the pacing of the relationship developments was really well-done and corresponded to perfect times with the rest of the story. The satisfactory ending, leaving me bursting with emotion and love and colors and words, is pretty evident of that. Full of descriptive imagery, captivating Indian folklore, and a journey between two souls for a wish that could change their lives, A CROWN OF WISHES enchants a reader from start to finish on this magical journey. Vikram and Gauri are so easy to love, but the other characters stand out as well; Chokshi’s writing breathes life into even the most minor of characters with their enjoyable dialogue and ulterior motives. There are so many things to love about this book, from the amazing characters to superb representation of Indian culture to the exciting journey. Fantasy lovers out there will devour this one, and readers looking for a romantic and thrilling adventure will definitely fulfill that search with this book. “His belief felt like heat that crinkles and greases the air. The force of it pressed and needled the world, as if it could summon kingdoms out of sheer force. His conviction set me alight. Why so romantic – I cry. Want more? Check out my fan art for The Star-Touched Queen over here, as well as my art for the characters in A Crown of Wishes over here. I was so excited for the first book, but I sadly couldn’t get into it. Everyone says this one is better though and you know I can’t resist a slow swoony romance, so I’m going to give book 1 another try so I can dive into this. I’m glad you loved it so much, Aila and I hope I will too. I also think that even if you didn’t get into the first book, still try this one! There is similar writing style, of course, but the main adventure and characters are totally different. So. I hope ou adore this one too. If TSTQ worked for you Tasya, then this one will definitely be a hit too! ❤ Can't wait for you to read it! I honestly will read anything Chokshi writes at this point. Haven’t read the Star-Touched Queen yet. I meant to get the book last month but didn’t have the chance. Still, I’m glas you enjoyed this book! I can totally relate with sometimes books leaving you in the air with the descriptions, so it’s good that this one did a better job with it than the last one. I am so excited to read this book. I enjoyed The Star-Touched Queen but I was disappointed that the secondary characters weren’t as fleshed out as I’d have liked and felt that they only served to further Maya’s own journey. I am glad that this doesn’t seem to be the case with this book. I’m excited to see where this journey takes Gauri and Vikram. great review and that artwork is stunning. Ooh the secondary characters are definitely more fleshed out in this one. I feel like TSTQ’s journey was a bit more isolated because it was more about Gauri+Vikram’s kingdom than anyone else. But this one had much more going on, including awesome characters that appear!